Advice: Invest in SIP mode. Target – Rs 1572 in 18 months. eClerx is a niche Knowledge Process Outsourcing firm based in Mumbai. Their focus is on Financial Services and eCommerce, Sales and Marketing customers for process management and analytics. Rapid growth, 4000+ employees, steady 33% EBITDA margins and scale up by customers makes this an attractive firm. Invest for the long term in this soon to be Mid Cap. eClerx is a KPO firm focused on Financial Services and Sales & Marketing organizations. It is a 341 crore revenues, 2155 crore market cap firm with around 4000 employees, and offices in Mumbai, Navi Mumbai and Pune. It is India’s first and only publicly‐listed KPO. They have deep domain knowledge in the defined verticals. The services provided include process outsourcing and process consulting. Key customers are top Investment Banks, Commercial Banks, manufacturing, retail, travel and media companies. North America provides 61% of revenues, Europe 32% and 7% ROW. This is a typical revenue profile consistent in the IT and BPO industry in India. M&A: eClerx acquired Ingentica Group in 2007 for US$3m. This acquisition was assimilated well. Some clients were dropped as the accounts were found unprofitable. eClerx is currently open to M&A in identified niche areas. Shareholding pattern is: Promoters Indian 27.5% and Foreign 27.4%; FIIs 24.5%; DII 9.5%; Bodies Corporate 1.6 %; Individuals – retail and Other 9.6%. Promoters are strong and stable. Five new clients were added in this quarter. Total number of active clients increased to 50. Provide business and data analytics that can measure, benchmark and report process performance. The offerings are Knowledge based services with a focus on the defined few verticals. They have a linear business model – billings are proportional to the number of dedicated employees. However the range of services is wide enough that customers can be mined for adding to the service bouquet and increasing revenues per customer. Once a routine but important process is handed over to a partner like eClerx, customers are unlikely to take it back unless the partner messes up. Thus eClerx has Long term contracts (2-3 years) with recurring revenues. This gives a stable and predictable revenue flow. It started with essentially Financial Services domain, but has successfully diversified its business, thus de-risking the overall business portfolio. Integrated IT and BPO firms. These are IT firms that have extended their service offerings to BPO and KPO. They are doing well. However their focus remains on higher end IT services. Focused BPO firms have offerings across verticals and service areas, and have expanded rapidly. Captive BPOs. Many US and European firms set up captives in India to take advantage of Indian talent. However after a period of time they are not able to sustain due to high attrition and stagnant growth prospects. Some like Genpact (GE Capital) have been spun off, while others have been acquired by Integrated IT firms. Niche KPO/ BPO are able to sustain and even get higher billings due to better domain skills. The IT and BPO industry from India is well established and accepted worldwide. The availability of bright young talent is high here; Internet and telecom networks enable global distribution of work; Salary levels in India remain a fraction of those in the developed markets; English as the language of communication is the glue that holds these partners together. The industry expectations are that for the next 8-10 years, these factors will remain positive, and will not be significantly challenged by countries like China, Philippines, Turkey or Eastern Europe. The key strength of Indian IT and BPO in this competitive scenario will be Managerial and process maturity and ability to handle larger and more complex engagements with global customers. This will be tested in the form of global tenders to handle large outsourcing deals. eClerx had its IPO in Dec 2007. It was oversubscribed 26.3 times. From its bonus adjusted IPO price of 210, it has appreciated to 740, giving the initial IPO investors a gain of 38% CAGR. See Fig 1. 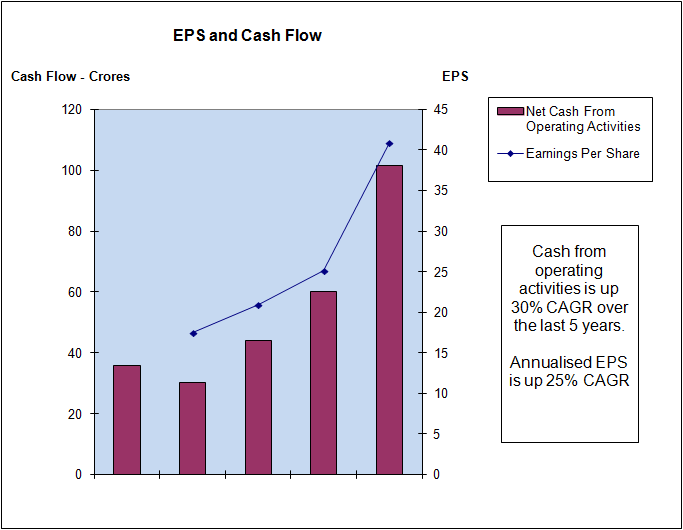 EPS has also grown at 29% CAGR over the last 4 years, see Fig 3. The financials and PE of eClerx has been projected for the next 3 years. The current PE of eClerx stock is 15.2 right now, above the industry average of 12. 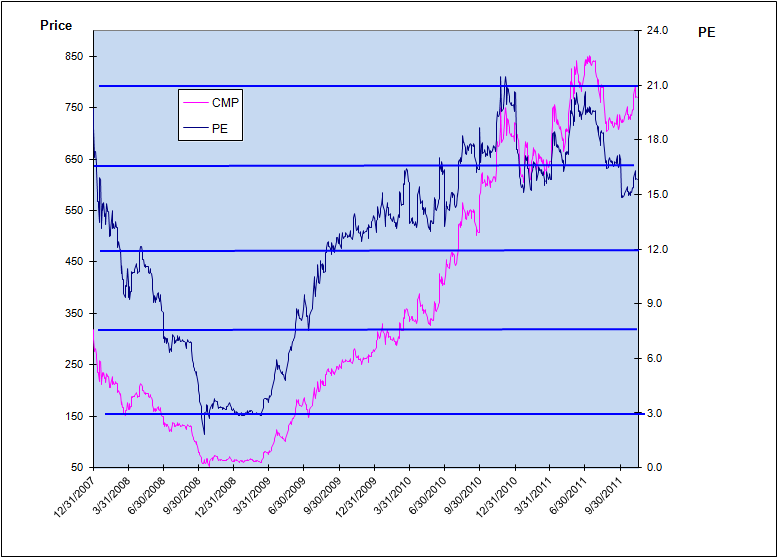 The Price and PE chart Fig 4 – shows that the 2008-09 period of US financial weakness had a price impact on eClerx stock. 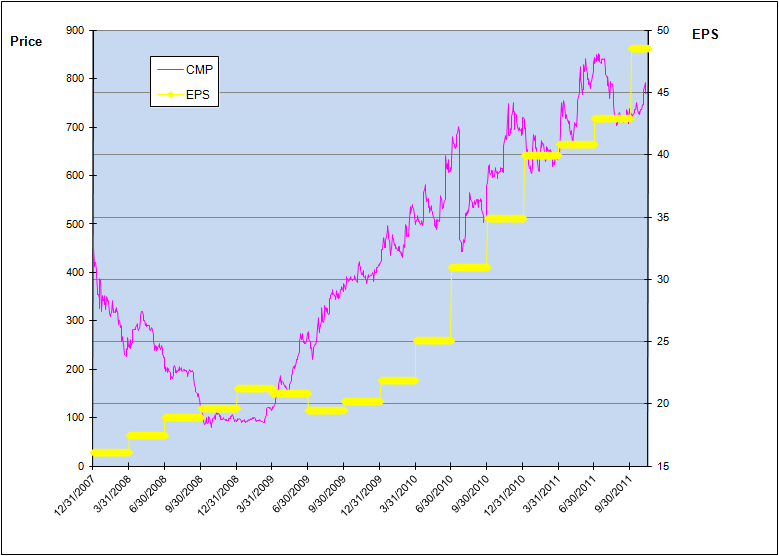 The view of the EPS chart – Fig 5 shows that this fall in prices was unwarranted. 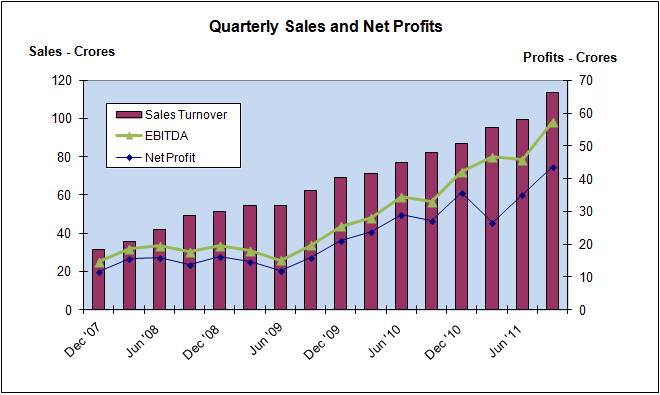 The EPS continued its rise thereafter, and the share price smartly recovered. Cash and Cash equivalents are at 179 crores. This is a healthy war chest with which eClerx can look at new acquisitions or invest in organic growth. Client concentration. The top 5 clients contribute 87% of the revenues. This is an asset – current clients are ramping up (this was 82% last year). However, it is a risk, since any relationship gone sour can affect revenues to the tune of 10-25%. Attrition is high in eClerx at 35%. However their processes are such that within one week, a replacement resource is found and he starts getting billed by the client. This minimizes the impact of high attrition. Also attrition is expected to plateau in the next few quarters due to general slowdown. Financial sector headwinds. The European countries debt, Eurozone crisis and USA’s debt issues are threats to the financial services sector in the USA. However the investment banks are better prepared for this in 2011 compared to 2008, and should be able to weather this storm. For eClerx business is not affected unless a customer ceases operations, as many of the processes they run are critical day to day tasks, part of the core normal functioning of the firm, and not a discretionary expenditure. The eClerx stock reached a 52 week high of 874 on 8th July this year, and is currently at 16% below this. This is good point to start accumulating this share. At current levels, eClerx share is above the 50 and 200 DMA levels. This indicates the share is likely to continue to move up. Over the past 4 years, the average PE of the stock has been 12. However the business is stable and growing, and should be able to command higher PE levels going forward as the business scales up and the market cap moves into the Mid-Cap range. Near term positives include the weakening of the INR against the USD that should boost eClerx revenues and profitability. It is an exporter of services, but most of its costs are in INR. In the Indian IT/ KPO industry, eClerx is a small player with a good niche. The operating margins at 33-35% are excellent. The real potential for eClerx is to mine their roster of current customers for additional business. This executed will itself provide 30-40% revenue growth in the next few years. Strong business leadership – cofounder / promoters are experienced in banking, investment banking and consulting industries in the US. High Dividend Payout ratio at 60% plus, indicates good management attitude towards shareholders. 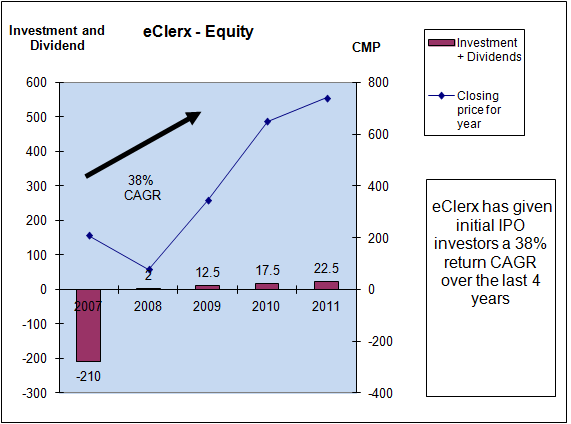 The 18 month projection – for March 2013 – for eClerx is Rs 1572, a 110% appreciation from CMP.